Water is a finite resource that is vital to all life. 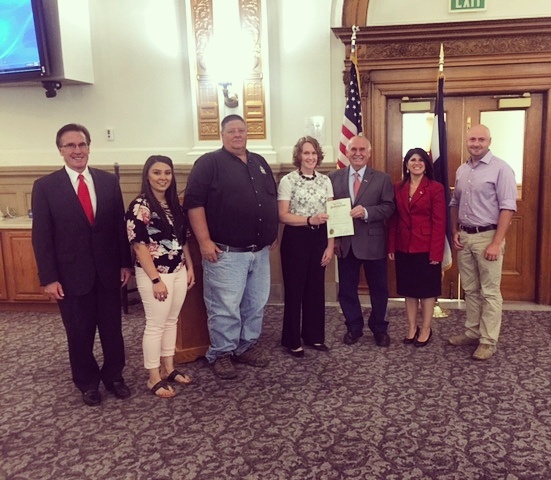 To bring awareness to the many benefits of irrigation practices that improve water use efficiency, Mesa County Commissioners today proclaimed July 2017 as Smart Irrigation Month. The Board of County Commissioners proclaims July as Smart Irrigation Month in Mesa County and members of Munro Companies, Inc., Ute Water Conservancy District, City of Grand Junction, Clifton Water District, Redlands Water and Power, Orchard Mesa Irrigation, Grand Valley Water Users’ Association, CSU Extension, Drought Response Information Project (DRIP) celebrate Smart Irrigation Month by helping customers learn how to use water more efficiently. From left, Commissioner Scott McInnis, Andrea Lopez, Dave Reinersten, Katie Powell, Commissioner John Justman, Commissioner Rose Pugliese, Joe Burtard. Ute Water External Affairs Manager Joe Burtard shares with the Mesa County Commissioners the importance of irrigation technology that can be utilized for substantial water savings. Ute Water Representative Andrea Lopez, Clifton Water Representative Dave Reinersten, Munro Companies Representative Katie Powell, and Ute Water External Affairs Manager Joe Burtard join forces to share Smart Irrigation awareness. Learn more about Smart Irrigation, here. Munro Companies, Inc., Ute Water Conservancy District, City of Grand Junction, Clifton Water District, Redlands Water and Power, Orchard Mesa Irrigation, Grand Valley Water Users’ Association, CSU Extension, Drought Response Information Project (DRIP), and Mesa County celebrate Smart Irrigation Month by helping customers learn how to save water and see better results.